Much of the recent debate over the border adjustment component of the House GOP Blueprint has centered on whether or not the value of the U.S. dollar will adjust in the manner economic theory suggests that it will. Economists maintain that the proposed border adjustment will cause a 20-25 percent one-time increase in the value of the U.S. dollar relative to other currencies. There are understandable concerns on both sides of this issue. On the one hand, importers worry that the value of the dollar won’t adjust sufficiently to hold them harmless against any price increases resulting from the tax on imports. Meanwhile, others worry that if the dollar strengthens by 20-25 percent it will reduce the value of foreign assets held by Americans while raising the value of U.S. assets held by foreigners. This revaluation of assets would, thus, cause a huge redistribution of wealth from domestic to foreign hands. While these are legitimate concerns in isolation, data tracked by the St. Louis Federal Reserve indicates that the dollar’s value relative to other currencies has fluctuated considerably over the past forty years—often undergoing wide swings within the span of six months to two years—and yet markets seem to adjust to each of these events with minimal disruptions. 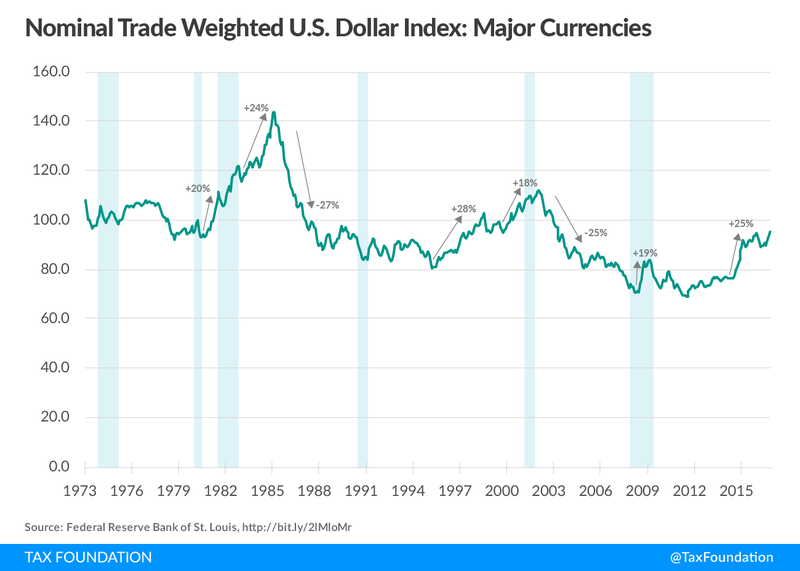 The nearby chart tracks the fluctuations in the nominal trade weighted U.S. dollar index against major currencies from 1973 to 2016. We can see that there have been at least three lengthy periods of a strong dollar—early 1980s, late 1990s, and 2010 to today. On the flip side, there have been a comparable number of periods in which the value of the dollar fell—the late 1970s, 1986 to 1996, and 2002 to 2008. The early 1980s saw two periods of sharp dollar appreciation. 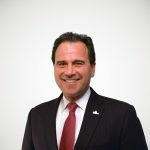 In part, this was likely the result of the passage of the Economic Recovery Tax Act of 1981, which dramatically reduced taxes on capital and labor in the U.S., and the Federal Reserve’s efforts to curb inflation in the early 1980s. The dollar rose 2o percent in the thirteen months between July 1980 and August 1981. After a brief plateau, it rose again by 24 percent between January 1983 and March 1985. The late 1990s witnessed a similar strong appreciation of the dollar. From April 1995 to August 1998, the dollar rose nearly ten percent per year, ending up 28 percent by the end of the period. After a 14 month dip, the dollar began strengthening again starting in October 1999. One year later, October 2000, it was up 12 percent, and by February 2002 it had risen by a total of 18 percent. Washington enacted two tax plans during this period, the Taxpayer Relief Act of 1997 and the Economic Growth and Tax Relief Reconciliation Act of 2001, but drawing a direct link between those policies and the dollar’s rise during the period would require a more in-depth statistical analysis than we are attempting here. The last ten years has seen two periods of strong dollar growth. From March 2008 and March 2009 the dollar rose 19 percent against major currencies. More recently, the dollar rose 25 percent between May 2014 and January 2016. Like most of us, the dollar does not seem to be immune from the forces of gravity. Following each of the peaks over the past 30 years, it has experienced rather steep declines. For example, from its peak appreciation in March 1985, the value of the dollar fell 27 percent by August 1986, a span of 17 months. Most likely, the was the result of the significant easing policy of the Federal Reserve in 1985. It is unlikely that the 1986 Tax Reform Act had much impact on the dollar’s value because the tax changes raised the cost of capital only slightly. Another steep decline in the dollar’s value occurred following the dollar’s peak appreciation in February 2002, when it fell by 25 percent by January 2004. Interestingly, the Jobs and Growth Tax Relief Act of 2003 was enacted during the midst of this decline. It’s an open question what effect, if any, the tax plan had on the dollar’s value, during a period of pronounced Federal Reserve easing. No doubt, these fluctuations caused some dislocations in certain markets. But the overall U.S. economy has weathered these events because importers and exporters alike have learned how to hedge against these dollar fluctuations and build safety valves into their contracts. Similarly, the owners of foreign assets have learned to play the long game, knowing that assets that may appear to be “worth less” on paper today, will be “worth more” on paper tomorrow. Indeed, the latest rise in the value of the dollar did not generate any notable news stories about a great transfer of wealth from Americans to foreigners. This historical data can’t predict whether or not the dollar will appreciate by 20-25 percent as the result of the border adjustment because the U.S. has never enacted a tax reform plan quite like the House GOP Blueprint. However, the data do show that the dollar has appreciated by more than that amount under many different conditions, so it would seem possible that it could rise by as much as a result of the border adjustment. The open question is how quickly.